Very Happy New Year to you Jenny Mac. I've enjoyed the year with you. Tonight I'm drinking champagne, eating filet and dancing. I'll toast one to you. Thanks for all of the great posts! Looking forward to more in the new year. Beautiful greeting card! Happy New Year to you as well! Making the old year go away safely, and welcoming the new year in warmly, we bravely step forward, after a few hours sleep, that is. Then we feast! Happy New Year. It will be a quiet one at home for me. I need to get out for a bottle of bubbly. I'm the only one who will drink it though. Mimosas in the morning? Happy Cocktails... I mean New Year to you!! Thanks JM. Sending you good wishes for a wonderful New Year! Happy New Year!!!! I hope it's a great one! A cocktail back to you! Happy New Year to you too!! And best wishes for a great 2010. Have a wonderful New Year! Looking forward to reading more of your witty and funny posts in 2010. Right back at ya, sweet lady!! Happy New Year, darlin. Hope it's a great one!! Happy New Year, Your Jenniness! You are getting quite snazzy with the holiday graphics. Another reason for me to fawn over you . . . Happy New Year! I hope it's a great one for you. Happy New Year to the Queen of Cocktail! A happy, prosperous and healthy New Year to you also. Happy end to 09! Whhoooo cocktails! And the same to you and yours. Thanks for a wonderful year of fun and delightful posts! I look forward to sharing 2010 with you. All the same to you!!! Have a great one! Thanks for stopping by!!! Have a Happy New Year! Happy New Year to you, my Wonderful Friend!!!! Wishing you the best in 2010!! And the same to you...Happy New Year! Oh, JennyMac, I look forward to all that you will amuse us with in 2010. I'll be ringing in the NY at home with friends and a bottle of Veuve Clicquot. Can't let the decade start with cheap champagne can we? :) Only 5 hours to go in Germany! Happy 2010. I'll be spending mine with 3 children, downing some sparkling cider. I live a wild and crazy life. What cocktail you makin' me tonight? Have a very happy new year! Heres to 2010! Happy New Year to you and yours, Jenny Mac! I'm so glad to have found your blog! Happy New Year, Jenny Mac! This is the first NYE in a number of years that the hubs and I have had a sitter and we are looking forward to ringing in the new year in style! I'm sure you will too...I doubt there's much you do without style! Mrs. Marvelous Mac I think I need a bucket full of cocktails but I'm here to wish you and yours a magnificent New Years Eve. Ring in 2010 with great abandon and joy. Just know I adore your blog and of course you. Everyone be safe, and have fun! Happy, Happy New Year, my friend. So glad to have met you. Well, my blog roll starts anew tomorrow. I'd be honored if you participate again in 2010. Leave a comment and you're on the blog roll! Thanks for visiting and commenting in 2009. Happy New Year! I will raise a flute in your honor! VERY best for 2010 to all the Macs! Raising my glass to you. Cheers to a brilliant and gorgeous 2010! Happy New Year Jenny Mac!!!! Rightbackatcha, Jenny! This blog has been one of those serendipitous little gifts from 2009 for which I'm delighted and grateful! May you and your family have a Happy 2010. All the best! Happy New Year JennyMac! I look forward to what you will bring to the table throughout 2010! Happy New Year JM, wishing you much happiness in 2010. Keep making me laugh AND think and I will be thankful to you for the spice you add to the sauce that covers the taste of *shudder* over boiled vegetables that sometimes lay beneath it. Happy New Year!!!! I hope it's filled with wonderful things! I've enjoyed your posts and look forward to more cocktails here in 2010. Happy New Year, Jenny Mac! Hope you had a wonderful evening and are enjoying the day so far. Thanks for the cocktail, JennyMac! It's been real! Worry less, relax more. That's my recipe for the next 12 months. Here's to 2010...Happy New Year! 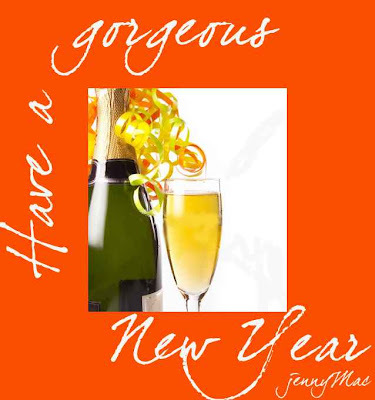 Hope 2010 brings you abundant blessings, JennyMac. Did you have a great one!!??? Here's to 2010, bring it on, sister!! Hope you have a wonderful and happy 2010!! Hope 2010 brings many wonderful blessings your way! P.S. The recipe I used for the sea salt truffles was from Pioneer Woman's website. Happy New Year to you and the family! To many more post that make me laugh out loud and almost pee my pants :). Happy New Year to you little lady!!!!! Cheer! And, Happy New Year to you. I hope your new year is off to a wonderful start! I've enjoyed the year with you and am glad I got to "meet" you! It will be a quiet one at home for me. I need to get out for a bottle of bubbly.